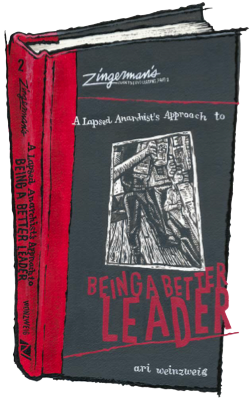 We’re thrilled to share the news that we’ll be sending Zingerman’s Guide to Good Leading, Part 2: A Lapsed Anarchist’s Approach to Being a Better Leader to our local printer this week! While Part 1 looked at the “secrets” behind Building a Great Business, Part 2 will look at the leadership style that has helped make Zingerman’s such a special place to work and to eat. The book includes “Secrets #19-29” of the Zingerman’s Experience, including essays on the energy crisis in the American workplace, servant leadership, stewardship, why everyone’s a leader, Zingerman’s entrepreneurial approach to management, and Ari’s approach to Anarcho-Capitalism. While everything in the book draws on what Ari and others have learned and live at Zingerman’s, it’s all totally applicable to organizations of all sizes and scopes—it is, as Ari says in the introduction, leading towards a new way to work.